For more than 40 years, American designers Charles Eames (1907-1978) and Ray Eames (1912-1988) helped forge some of the most valued material aspects of American life, such as the Eames Chair. The Eameses were integral to the mid-century design movement, active in the development of textiles, photography, corporate design, and architecture, the husband-and-wife team are perhaps most well known for their furniture. Charles and Ray Eames pioneered the use of new materials such as plywood and fiberglass, and in doing so transformed the way homes were furnished in America and beyond. At the time, the Eames production office provided sleek designs with functional affordability to middle class homes; eventually, more expensive pieces were added to the roster. Today, many of these furniture designs can still be found – at a price. Though Charles and Ray Eames were pioneers in varied fields, from architecture to photography, this article will focus on the groundbreaking furniture designs produced by the husband-and-wife team by era; from postwar simplicity to mid-century luxury. By the mid-1950s, the American economy was booming again. For the first time since the Great Depression, the American public appeared ready to treat itself to symbols of affluence and leave behind the austerities of the post-war years. Charles and Ray Eames, ever aware of the changing economic situation, met the market with the Eames Chair (Eames Lounge Chair) and Ottoman; a luxurious leather recliner which signaled a new direction in American consumerism. It is not certain whether the chair was made in response to consumer demand, or if the Eameses created the market for it. Either way, the introduction of an unashamedly expensive lounge chair and ottoman clearly recognized an economic shift in 1950s America. When it was first produced in 1956, the average annual wage for men in the United States was around $3600. Before the price of the leather covering, the Eames Lounge Chair and Ottoman cost $600. Nevertheless, it was an instant hit and holds a lasting legacy as arguably the most iconic production design of Charles and Ray Eames. According to critics, the chair represents a careful balance of tradition and modernity. Well made, high quality, and comfortable, yet sleek and pleasingly simple to behold. Like many other Eames designs, these lounge chairs are still produced and are hot commodities in the consumer marketplace. 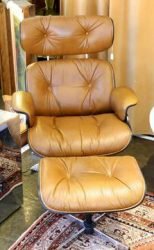 Though they are incredibly desirable, Eames Lounge Chairs differ from the DCW and Fiberglass furniture in that secondhand examples cost relatively less (as a proportion of the average annual salary) than when they first came onto the market. Though a new chair from Herman Miller will run in the realm of $5000, an average secondhand piece in good condition can sell for $1500 or less, but generally between $2000 and $3000. As with all Eames designs, there are obvious exceptions for particularly desirable or extremely well-preserved examples. The DCW, or Eames Plywood Chair, was introduced to the world in 1946 by the Museum of Modern Art (MoMA) in an exhibition titled “New Furniture Designed by Charles Eames”. Societal norms at the time made it difficult for people to accept that the female Ray Eames was as instrumental as her husband in the development of Eames designs, a point which Charles often had to explain. To display the extreme durability of the Eames Plywood Chair, the show featured a large turning drum, continually flipping the chairs around. The DCW design represented a shift in the way standard chairs were designed, as it was rare for a chair to be finished without upholstery, and even more rare for a non-upholstered chair to be considered comfortable! In a film created by the Eameses about the DCW’s development, they explained that research led to the discovery that a “certain relationship of support gives optimum comfort to a surprisingly large number of people”. Instead of plush upholstery, this comfort was based on a perfect molding to average body shape; with the result that a hard, rigid, and inexpensive material such as plywood was actually able to provide a remarkable degree of comfort. The “secret” to the Eameses success was simple: consult their audience, conduct research, model, test, remodel, and re-test a hundred times more. In a few words, their secret to success was hard work, dedication, and a desire to create exactly the right product. In the postwar years of austerity and simplicity, the DCW was an immediate hit. Some examples were upholstered and/or stained, but the standard chair has remained almost exactly the same and remains in production by Herman Miller to this day. For the mid-century enthusiast looking to buy a DCW chair today, the original Eames concepts of cheap and affordable must go out the window. 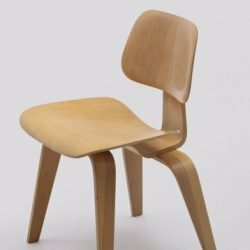 A standard Eames Plywood Chair from the first several years of production will generally run between $1000 and $1500, with newer or well-used pieces costing less and pre-production or other special examples (for example limited edition upholstered chairs) costing substantially more. Considering that the DSW plywood chair virtually kicked off the mid-century modern movement and remains a benchmark in furniture design, it should not be surprising that there are huge numbers of collectors willing to dish out the money for these simple yet sophisticated pieces of history. Following on the success of the Plywood Chair, Charles and Ray Eames continued their research and development in new production materials. Fibreglass being inexpensive, extremely durable, and capable of being molded into almost any shape, was a natural candidate. In 1950, the first Eames Molded Plastic & Fiberglass Armchairs came onto the market. In keeping with the DCW, these chairs were designed specifically to provide durable, affordable, yet stylish home furnishings for the average family and were entered into the “International Competition for Low-Cost Furniture Design”, sponsored by the Museum of Modern Art. This competition was created out of necessity, to address a chronic need for low-cost housing and furnishings in post-war America. There were other driving factors too: the development of affordable automobiles (and a diminished need to entertain within one’s home) and a shortage of building materials meant the average new home was smaller than ever before; new furniture also needed to be adaptable to smaller housing units. 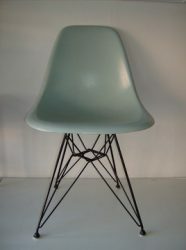 The Eames Molded Plastic & Fiberglass Armchairs were an immediate success and were offered in an array of colours and with different types of bases: the “Eiffel Tower” metal base, a wooden base, and a rocker base being the most prominent. The Molded Plastic & Fiberglass Armchairs remain one of the most famous designs of Charles and Ray Eames and continue to be produced today, albeit with a production hiatus through the latter part of the 20th century. The Eameses fiberglass furniture holds another, less tangible significance, too. Of all their designs, these pieces come closest to achieving the ideal of “getting the most of the best to the greatest number of people for the least”. Plastic and fiberglass combine strength with a comfortable flexibility, and are well-suited to mass production resulting in an affordable end cost for the consumer. Nowadays, these pieces are understandably sought after. A simple Eames fiberglass chair from the 1950s will cost $400-$600 in a retail setting (and generally less at an auction house, if you can find one!). Of course, particularly desirable examples cost more. Through their four decades of innovation and design, the Eameses continually and rigorously pursued new concepts and forms through a serious sense of fun. Time and time again, Charles and Ray demonstrated how a well thought-out design could improve both quality of life and human understanding, and that simplicity can also be sophisticated. As a lasting tribute to their sleek designs based on scientific study and a continued desire to improve, Eames furniture designs remain stylish, fresh, functional, and are continually sought out in the marketplace by consumers today. The most amazing thing is that their groundbreaking innovations did not stop at furniture. Charles and Ray Eames designed homes and showrooms, invented toys, created a highly innovative “Case Study House” for a magazine contest, and even produced films- including a multi-screen installation at the 1959 Moscow World’s Fair! With this in mind, they could almost be considered modern day ambassadors; striving to unite the world with refreshing, innovative, and practical ideas.